Either by day or a little after sunset, in fine weather, a little, light, long-drawn cloud is seen, like a long very straight line. Not every long straight line in the sky is a contrail. Here Aristotle suggests it’s “a sort of wave-mark in the air”. Basically an isolated row cloud, low on the horizon. Aristotle’s take on the weather is very interesting. He has quite an extensive section on atmospheric optics – halos, sundogs, etc. Pretty advanced for 2347 years ago. There actually WERE contrails before airplanes were invented, just rather rare, and of a different sort. 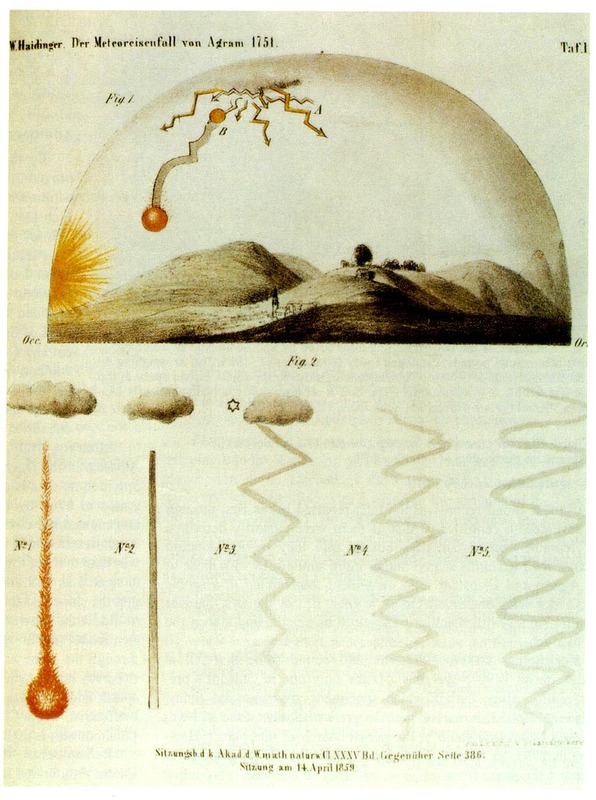 Here’s an image of one from 1751, showing how it formed, and how it was distorted by the wind. 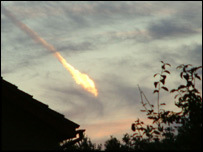 These are meteor trails, which could be comprised a disintegrating meteor, but also of clouds precipitated by the dust and pressure changes. 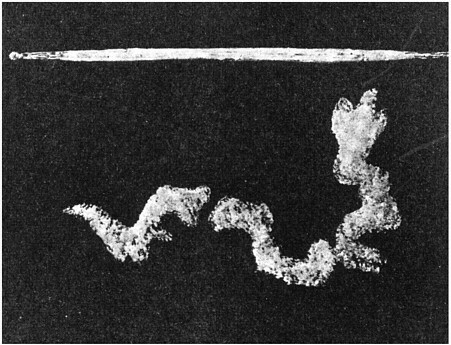 This type of contrail has been around for billions of years. 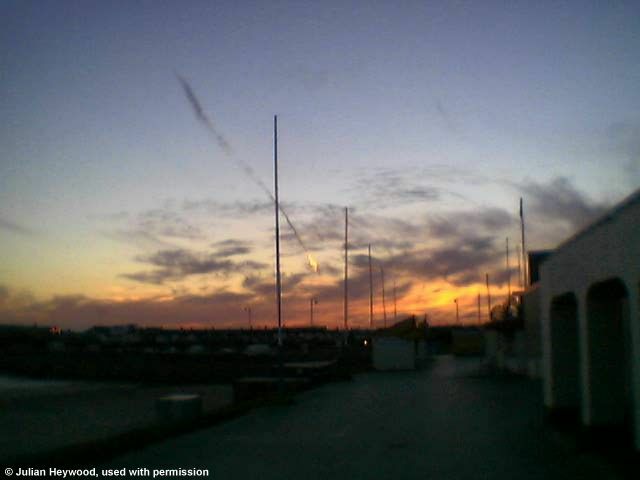 The next photo was thought to be a meteor contrails with a fireball, but later analysis sowed it was more likely a normal contrail combined with some cloud and illuminated with the setting sun. Many of the chemtrail believers repeatedly claim that normal contrails are very short and use videos of airliners at different altitudes making different length contrails as some sort of distinguishing example between “chemtrails” and contrails. Whilst this is an amusing display of ignorance, it is interesting to note that contrails of such a length that would be classified by such deluded folk as “chemtrails” appear in old promotional films about airliners released in the 1950s. Whilst “chemtrails” are supposedly a new phenomena begun about 1998, identical long trails were proudly displayed promotional films in cinemas around the world showcasing new airliners such as the Boeing 377 Stratocruiser (a piston engined propellor plane that could fly at similar altitude to modern jet airliners) and the Boeing 707. 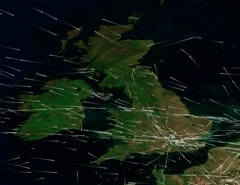 The film of the first year of operation of the 707 shows numerous large persistent contrails that could only be labelled “chemtrails” by delusional conspiracist’s arbitrary comparative length definitions. Look﻿ at this classic old 1959 film of the 707 in its first year of operation. Thanks Greg, great videos! I think people with strong beliefs sometimes have rather selective memories. The first one in particular has some classic footage of early 707s and long contrails from the 1960s.